I’m hiding out in my bedroom with the door locked, pretending I don’t know anyone’s home. I don’t want anyone to bother me or tell me what to do. I just want to play my records and write in my journal. More than anything, I don’t want anyone to make me study for that test on Friday. Oh, but wait. That’s not me. That’s my son. I’m not the one in 7th grade. I’m not the one getting D’s in Math and Science, or having grumpy teachers send notes home telling me I better get my act together. I’m a grown woman. I’m the mother of two. Or am I? I’m starting to have doubts. But sadly, that was a crackpot notion. I was promising to stop a runaway train with my bare hands. A feat that simply cannot be done. Kids have to go through their own personal struggles and no one can protect them after a certain age. Lesson learned. My sixth grader brought home a D. So, I sit with him night after night after night trying to get him to understand how to multiply and divide fractions. But I’ve forgotten myself. How do I multiply fractions? I haven’t done it in years. The frustration of not getting it returns. I send him back to school on test day, sure that he will get an A. I wait. I wonder. I pace the halls. I Freudian slip and say, “I wonder what I got?” But he returns with another D, and I’m crushed. How was that possible? The both of us went over this a million times. So, I do what any desperate parent does who lives vicariously through her kids: I yell at him and take away his video games. Maybe, by accident, it just slips out, I even berate him for not being able to understand the material. The guilt-laden words, “C’mon, what were you thinking?” make their way from deep inside my stomach, up my throat and out my mouth. To top it off, I get the dreaded letter sent home about his performance. He’s not paying attention in class; he’s fooling around with his friends; he needs to be more respectful to his teachers; he needs to stop drawing cartoons in his notebook; this is his third detention in six months; if his behavior and his grades don’t improve he will likely be kept back. Sure, it’s his behavior under scrutiny and they’re his grades. But really, they’re mine. It’s me back in middle school, floundering around, doggy-paddling to stay afloat. I was a rotten student. And every bad grade he comes home with is a blazing reminder of my own poor performance back in the day. Every detention he gets, it’s me who sits with the shame. And every parent-teacher conference or note sent home is not about his behavior, but mine. Of course, you could say this is narcissism at its finest. Whatever happens to others becomes internalized and thus, happens to me. The apple is the tree. It’s all about me, me, me. Yet, my children are an extension of me. There’s an interconnectedness there that cannot easily be disconnected. And so, I empathize with their plight, particularly when I too have lived through the same. Isn’t it called compassion? At least that’s what I tell myself it’s called. In fact, I sat through one of his conferences just recently and listened to all of teachers say the same thing. And I’m sure I heard it this way: you need to stop fooling around, Tracy. School is no joke. It’s time to get serious. And as I sat in my little 7th grade chair, so low to the ground, like a shrinking violet, with my knees knocking under the desk, I could feel my heart pound and my face get hot with humiliation for not being a better student. It’s not just me. My sister-in-law is about to register her son for Kindergarten, but she’s in a panic. Once he gets on that bus, all by himself, she said, she can’t protect him. She was a shy kid too. She knows how rough it will be to take that twenty-minute ride to school, knowing no one, and having no one to hide behind or talk to. The wheel goes around for everyone. And yet, there’s a reason we as parents must shoulder our kids’ burdens. Isn’t it too much to ask a shy five-year-old to handle a bus ride by himself? Isn’t it too much to expect a seventh grader to perform flawlessly in every subject when, like his mother, he is a dreamer too? I so often believe it is. And so, is the lesson learned here to hold on for dear life? To live through things again and again until you get it right? Even at the expense of others? Or does the girl with zero confidence who is still holding on for dear life, need to let go of the death grip she has on her son who, by no conscious choice of his own, reminds her everday of her own past failures? Perhaps the lesson is to remember how rotten it felt to not be believed in or, to not be loved above all else, despite your limitations. Lessons, lessons, lessons. They are learned at all ages, And perhaps I need to let go. Not of my son, but me. I need to forgive the girl who made so many mistakes and lazed around the house without an ambitious bone in her body or a shred of self-motivation. I need to let go of that wasted time that I often foolishly think I’ll ever get back. Humans! The only animal on the planet capable of so many deep-rooted pschyological weirdness. Alas, I did bloom. I was a late bloomer. And as Sharon Olds says, “anyone who blooms at all, ever, is very lucky.” But, in the end, it’s not about me. It’s about him. 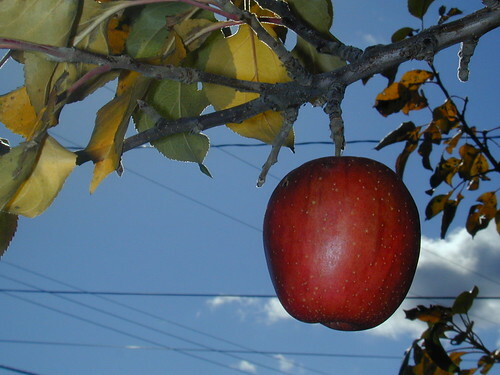 It’s about the tree shaking the apple off its limb and letting it roll where it chooses. It’s about saying: I may be suffering right along with you. You’re not alone. But you’re free. You are your own person. And I love you unconditionally. This entry was posted in Writing and tagged blog, blogging, children, education, kids, kindergarten, motherhood, parenting, personal, school on March 13, 2011 by sevenperfumes. I feel the same way when my oldest brings home bad grades. It’s really tough on him because he so badly wants to make me proud. So I have to tetter on similar decisions of letting him make some mistakes and me guiding him towards the right choices for studying. We all want to raise our kids so they can handle these problems without our intervention. Something to look forward to when my 2 who are both under 2 now grow up.